I was getting ready to make chicken enchiladas one night and I decided I didn't feel like stuffing each enchilada individually, so I made an "enchilada casserole." 1. Cook the chicken with some onion in a skillet until white all through. Shred chicken. Keep the onion. 2. In a separate bowl, mix together the cream of chicken soup and the sour cream. 3. 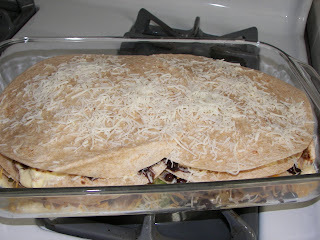 Layer two tortillas (I used the small tortillas so it would fit in my pan), then some of the shredded chicken, then some black beans, then some of the sour cream mixture. Then, put some of the green peppers and shredded cheese on top. Repeat these layers once or twice more depending on how thick you want your casserole. 4. Cook in a 350 degree oven for about 15 minutes or until hot throughout and cheese is melted. Sprinkle some more cheese on top and bake for 5 more minutes. 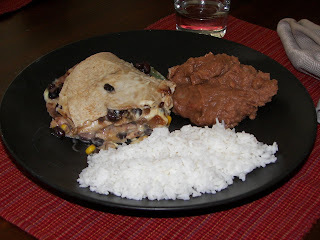 Serve with refried beans and rice if desired.